Is YAS QUEEN appropriate right now? 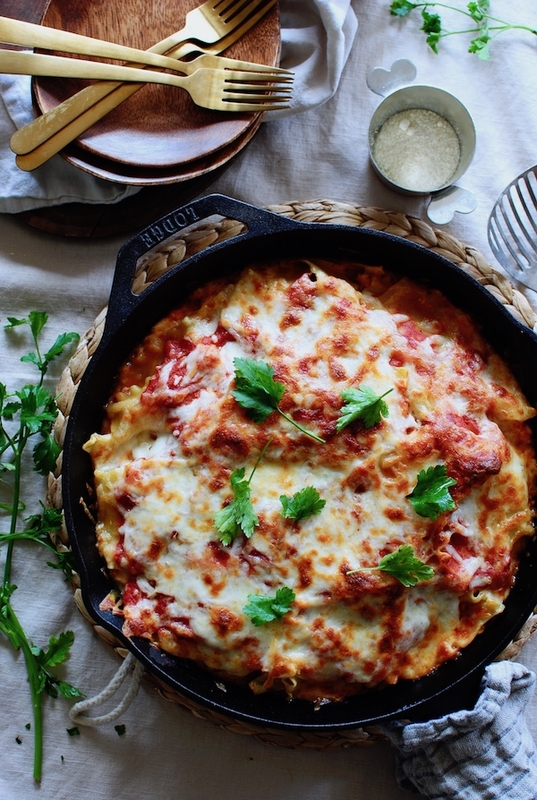 Skillet chicken lasagna. And not only that, it’s free form! 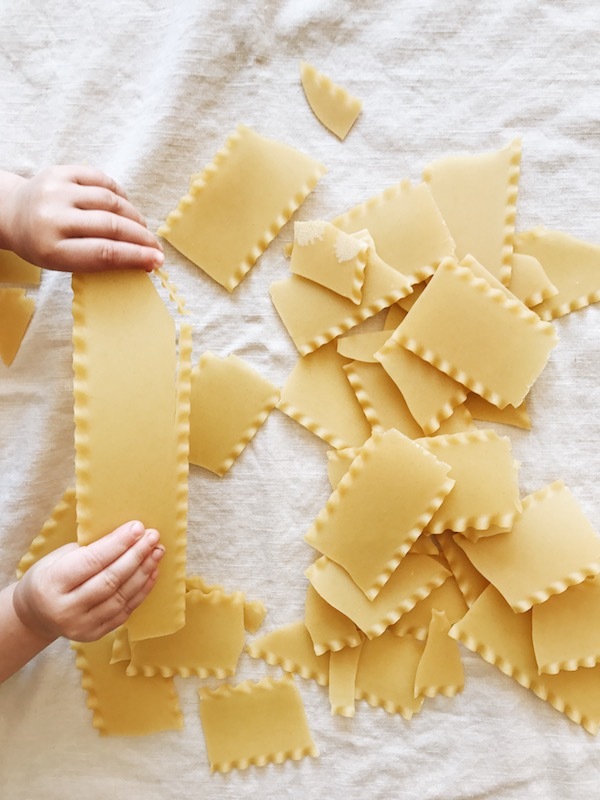 Meaning, your kids get to break the lasagna noodles into pieces and get a little bit too carried away with it but you don’t mind because you like to see them learning about cooking so you release your anxiety into the wild because some of the pieces are too small and now worthless and have fallen on the floor but you’re bonding so it’s okay. It’s that kind of recipe. Remember the sausage and kale lasagna roll ups I posted on January 24th, 20017 at 7:13am CST? Well, listen to this greatness. I only used, what, 10 of the lasagna sheets (two are missing from the photos because you know that alien husband I have who hates cheese.) for that recipe. MEANING, the rest of the box can be used for this pup! Not to be confused with, “for this, pup.” I’m not calling you a pup. I’m calling the recipe a pup. Commas are important. Never mind. 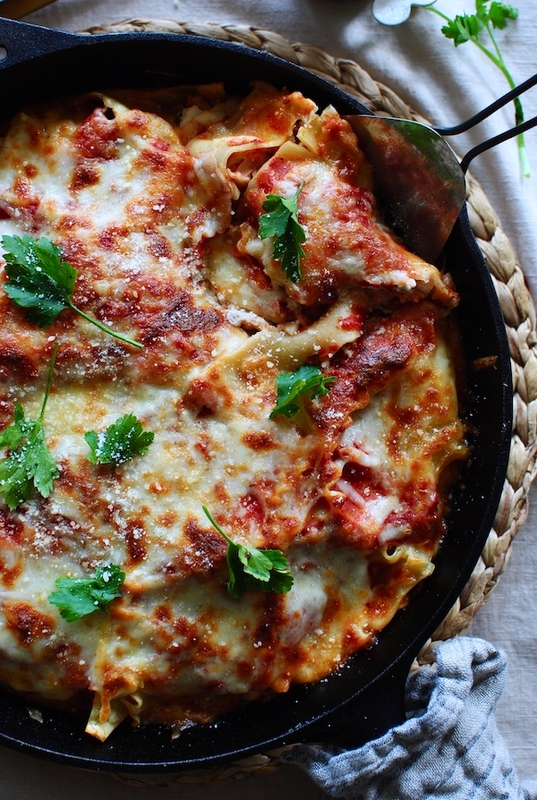 You’ll boil about 15 broken lasagna sheets. You might not even need them all! I had a few little nubbies left over. Another pimp thing about this recipe is the rotisserie chicken. Just buy one and shred her up. I think mine yielded about 4 cups of cooked chicken. So if you want to sear and shred chicken breasts, three should do the trick. But I highly recommend a rotis because DARK MEAT. The end forever. Finely chop up some fresh parsley and mix it in with a tub of ricotta. That with a pinch of salt and maybe a tiny bit of lemon zest if you think about it. Guh, sah gahd. So what you’ll do is just layer layer layer. Little bit of (store-bought!) marinara down in the bottom of a big cast-iron skillet. (I used a 13-incher for this) Then goes a layer of the cooked, broken lasagna sheets. Then some shredded chicken. Then a few dollops with the herbed ricotta. Followed by shredded mozzarella, and then more sauce. Repeat about three more times. 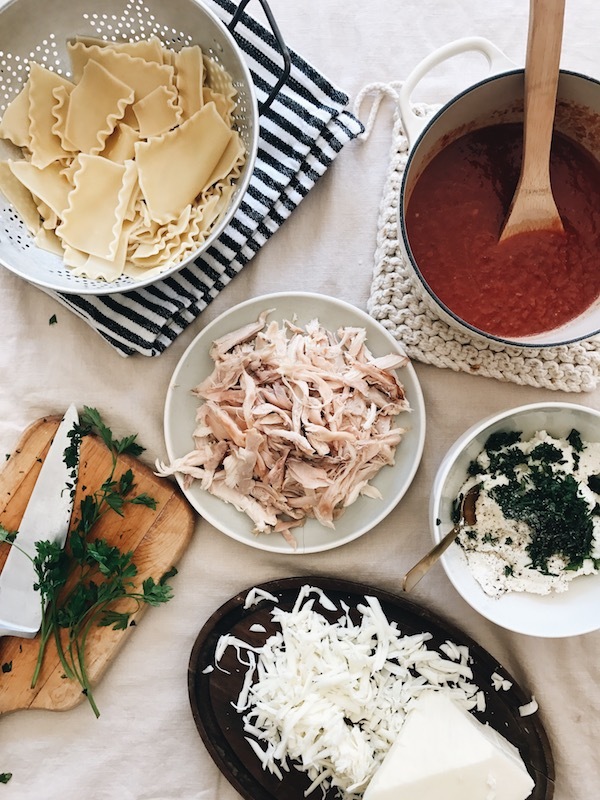 It doesn’t have to be perfect, because a) life and b) you’ll top it all with the remaining sauce and more shredded cheese and a smidgey of your combusting heart. Bake for 30. Broil for five. Weep for life. The key here is to let it sit! If you cut right into it immediately, the sauce will be on the runny side. But if you let it rest and marry and have 13 babies, it gives the pasta time to soak up the marinara. You want this for the pasta and the sauce. They’re such a cute couple! Then of course you’ll garnish with fresh parsley and parmesan. Der. I can’t wait for your mouth with this! 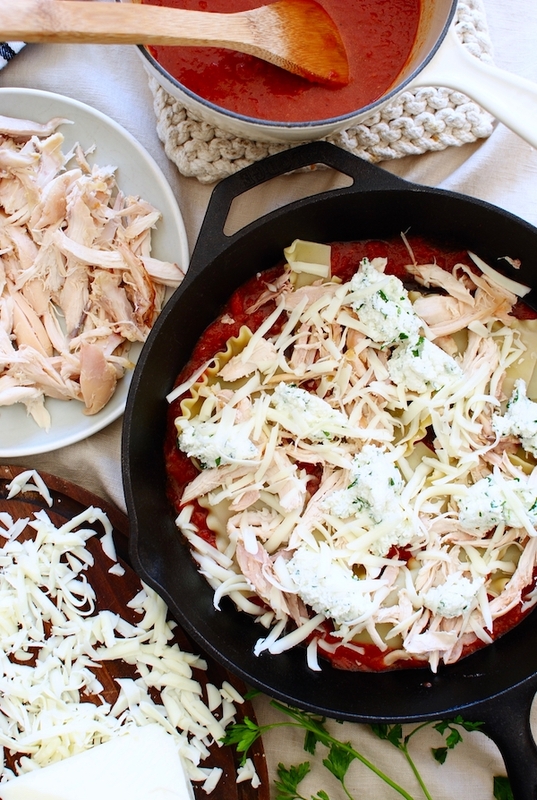 Cheesy, chicken, lasagna-y. Ugh, git git git. Can I say it now? Okay. YAS, QUEEN. In a medium bowl, stir the chopped parsley into the ricotta cheese, along with a good pinch of salt and pepper, and the lemon zest. 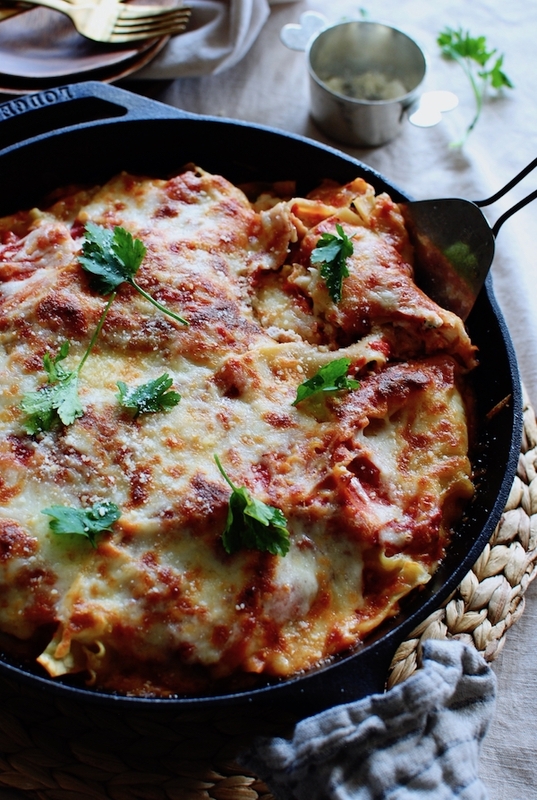 Keep layering until everything is in the skillet, ending with a layer of lasagna sheets. Pour the remaining sauce over the dish, followed by the last good amount of shredded cheese. Bake for 30 minutes, uncovered. Flip the oven to broil and let the cheese get browned and bubbly. Maybe five minutes. Don’t walk away! It happens fast. 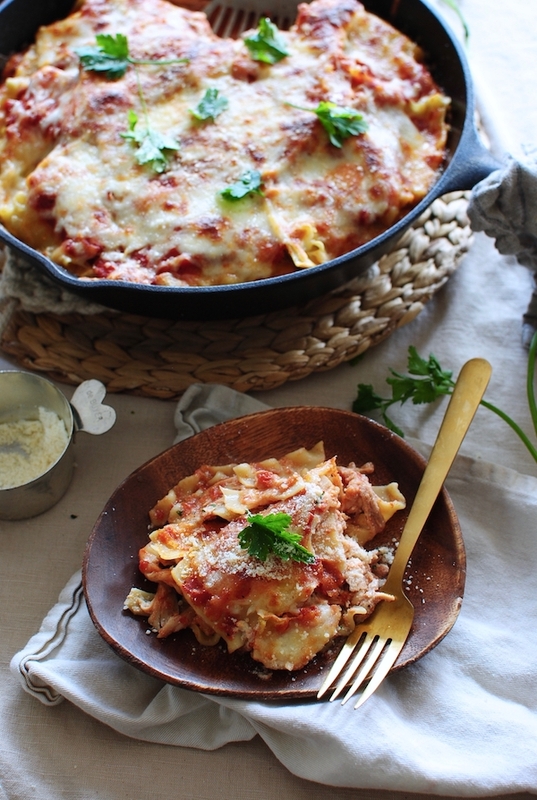 Let the lasagna rest for about 10 minutes, then dive in with your reckless soul. Garnish with extra parsley and parmesan! Serves 4-6, depending on the size of your portions. Looks delicious and so easy to make! I love minimal ingredients for a weeknight meal. Thanks for the recipe! The fact anyone does not like cheese is beyond my comprehension. Cheese is my life's blood and my joy (besides my family, of course, but cheese is right up there with them). This looks amazing and yummy and probably gonna happen over here real soon. And don't get me started on how much I adore dark meat. Another whole chapter. YASSS QUEEN! Still dying to make those sausage & kale roll-ups as well! I loooove cheese. My digestive system does not. Did you do the exact same recipe sans cheese for his? I'd love to see the dairy-free modifications for recipes if you're doing them anyway! That is one beautiful pup. Wowwee! That looks SPECTACULAR! 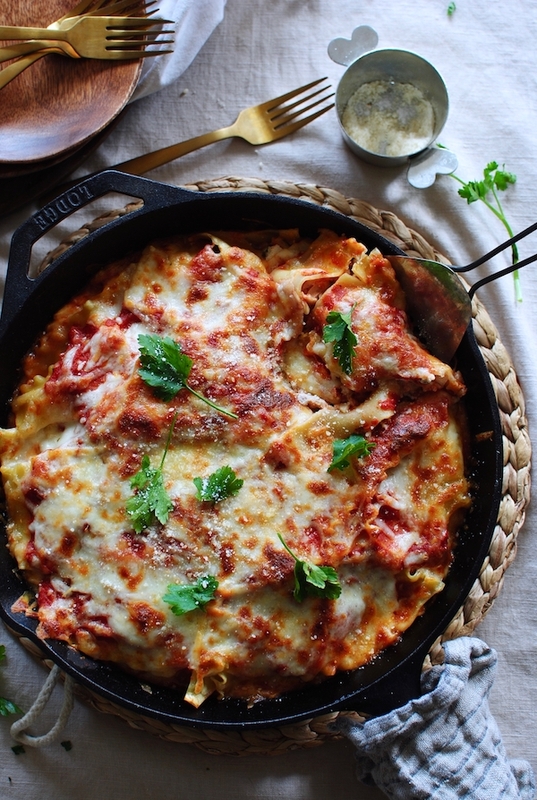 Iove me some lasagna but I do find the appearance to be old school...this takes it to another level...like something you'd find in Italy...or little Italy if you want to stay local. BOOM! Can't wait to give it a try! Thanks and CHEERS! this sounds amazing and i love how you write! I found you this morning via the ridiculous PB freezing scandal (i am in London) now i need to read all your recipes so thanks!